We were in Romania from the 18th March to the 17th April 2003. We entered at Giurgiu across the Friendship Bridge from Ruse in Bulgaria. The border crossing was straightforward and we cycled over the bridge without problems, when we were there the traffic was just a lorry every couple of minutes and it isn't a particularly long bridge. We left by the border with the Ukraine at Siret, again no problems here. There is a motel on the Romanian side of the border. We didn't fancy the direct road into Bucharest and having done it several times by minibus I'm glad we didn't try to pedal it. The traffic is quite fast but the road is narrow and in bad repair so vehicles are swerving around trying to avoid the potholes and each other. In general Romania seemed more affluent than Bulgaria, but the gap between rich and poor was also greater. The poverty means begging children and people asking for cigarettes, while the better off spend their money on petrol, but the government seems unable to maintain the roads. Not the best combination for a cycling holdiay! We found that the more minor roads were soemtimes in better repair than the major roads and refreshingly quiet, but all roads had bumpy and potholed sections and minor roads were sometimes unsurfaced. Watch out for the dirt tracks which can be excruciatingly bumpy. As in Bulgaria there is a lot of horse drawn transport, quite a few locals pedal around as well. The standard of driving is not wonderful. The latin influence means people go faster, and cut you closer (they even trot their horses at all times while the Bulgarians walk theirs!). We found that if a lorry was going to pass an oncoming vehicle at the same time as overtaking us, the best course of action was to get off the road. We found ribbon development along the majority of the A and B class roads, which made wild camping very difficult and in areas where the inhabitants weren't too friendly made it difficult even to stop. No-one was ever actively unfriendly to us, but in many places they would stare as we passed and not return our waves or hellos. We did successfully camp in someone's yard one night but otherwise we either pushed on until we found somewhere without development (the record for continuous development was something like 100km so this wasn't always practical), or stayed in a motel. These were as cheap as $5 a night for a room for two and were happy for us to wheel our bikes into the room. We got a map of Romania from the tourist board which marked the location of many motels. The Romanian currency is in a bad way, when we were there it was about 35,000 Lei to the euro. But at least you don't have to carry heavy coins - there are notes worth as little as 10 cents and the coins are aluminium! We spent $12 a day between us during the three weeks we spent riding from Giurgiu to Siret. We saw bike parts for sale in the market in a couple of towns, but it was all cheap low quality stuff. We also saw shops selling complete mountain bikes in a few places and a few shops selling accessories. Sinaia had a outdoor pursuits shop that stocked a range of good quality mountain bike components. There is a train timetable website at www.cfr.ro. Our limited experience of taking bikes on trains was that it was easy as long as the train was not too crowded and you pick one with big doorways (trains into/out of Bucharest are usually very crowded). Tip the guard with a packet of cigarettes and you will not get any official hassle. We did have some problems when our bikes were blocking the passageways and we'd bought the wrong ticket, but a $6 bribe sorted things out. We were there in March and April. Around Bucharest the temperature was usually above zero but certainly felt cold. In Transylvania we had several of inches of snow fall one night in the valley and the passes were always snow covered. Knobbly tires are essential in the mountains at this time of year. I think spring comes in late April and during the summer it gets pretty hot. The best riding we found in Romania was from Gheorgheni to Bicaz and then north to Vatra Dornei. This was scenic, not too busy and reasonably surfaced. 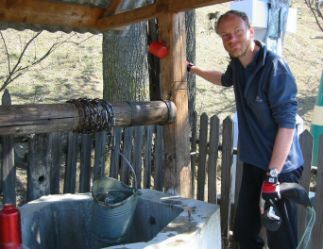 Drawing water from a well. If it looked clean and was not in a built up area we usually drank it straight. 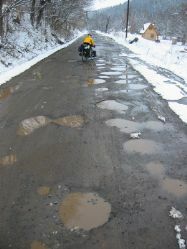 The roads can be truly awful!